Yesterday, many churches read about Mary and Joseph taking Jesus, their baby boy to present him in the temple. They were fulfilling the requirements of the law to offer a sacrifice for purification and present their firstborn son, acknowledging, that he belonged to God. What might we learn from that amazing day in the temple? Could it have any relevance for the times God calls us to do something and we are quite sure what we can offer just isn’t good enough? It’s recorded in Luke 2.22-40. There’s a lovely little detail in the account. 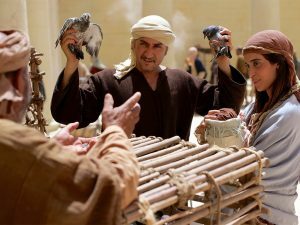 Luke writes that Mary and Joseph brought two birds as their sacrifice in accordance with the law. I’m sure that’s significant, because in Leviticus, when that law was given, the people of God were told that the required offering was a lamb. “However…” the command specified, “…if they can’t afford a lamb then they can bring doves or pigeons instead. It’s one of those tiny but wonderful details in the gospels. It reminds us that they are a peasant family. They can’t afford a lamb so they bring the offering set out for poor people. I wonder if they tried to work out if they could afford a lamb but decided reluctantly it was beyond their means. I wonder if there was any feeling of being inferior as they turned up at the temple with their offering of two birds. And yet as they bring their son, and dedicate him God, they don’t realise that they are in fact bringing a lamb after all. And not just any lamb. The lamb they bring is the lamb that every other lamb brought as an offering pointed towards. 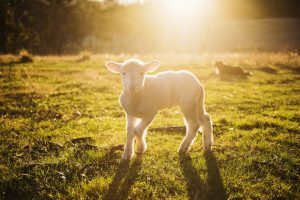 They are bringing the perfect, spotless lamb of God! So often we feel that we don’t have what is needed for the mission to which God calls us. We see our spiritual poverty and feel that what we can offer isn’t terribly impressive. But it’s all we have. And that is exactly what he asks of us. To give all we have, knowing it isn’t enough. To give our offering of two birds, or five loaves and two fish, or a widow’s mite. It’s not very impressive, it’s not even enough but still we are asked to offer it. As we do, he provides the lamb. He feeds the crowd. He opens hearts and changes lives. He builds his church, the new temple.